Smashed Potatoes Recipe - Smashed Baby Potatoes - VIDEO! Smashed Potatoes were originally published in February 2014. This Smashed Potatoes Recipe is a fun little side dish. They’re nice and soft with just a little bit of crispy coating from the skin. I love using baby potatoes for these smash potatoes because they’re the perfect size. Smashed Baby Potatoes are like a mix between fries and mini baked potatoes…or somewhere in between! They are just so tasty! This smashed potatoes recipe is so simple but so delicious. Smashed baby potatoes are the next great potato side dish! I love this Smashed Potatoes Recipe. Potatoes are kind of a staple dish, so I’m always looking for new ways to cook them. There’s definitely no shortage of recipes around here. You’ve got your baked potatoes, your home fries, and your mashed potatoes. But there’s always room for another tasty potato recipe if you ask me. Smash Potatoes are a great addition to any meal. 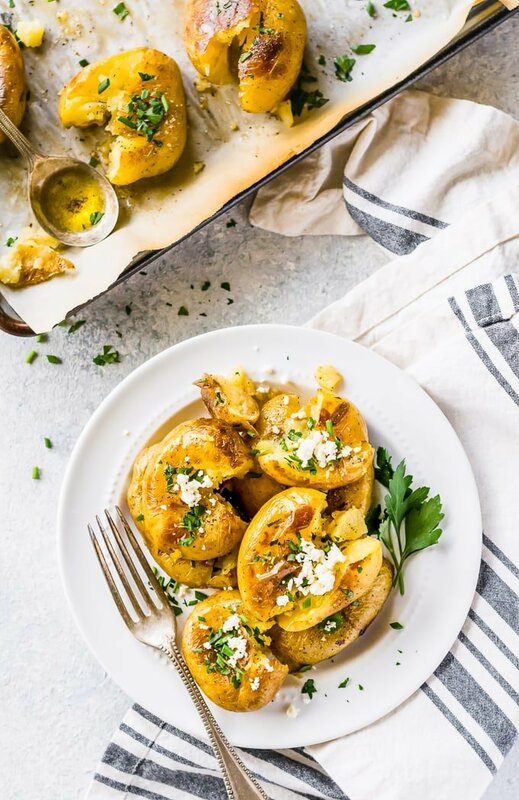 The texture and the simple flavor of these smashed baby potatoes is exactly what I crave. 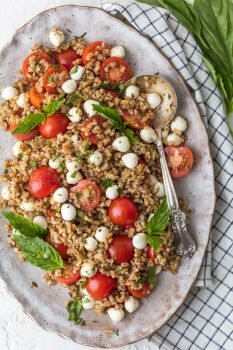 Simple side dishes are a must in any household…things that are quick and easy to make but still taste absolutely delicious. 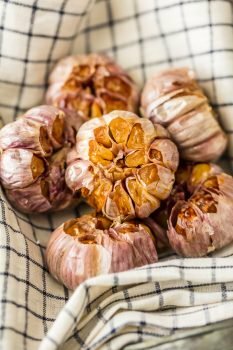 Something like this just goes with everything, whether you’re cooking an easy chicken recipe, a tasty pork dish, or something extra fancy. 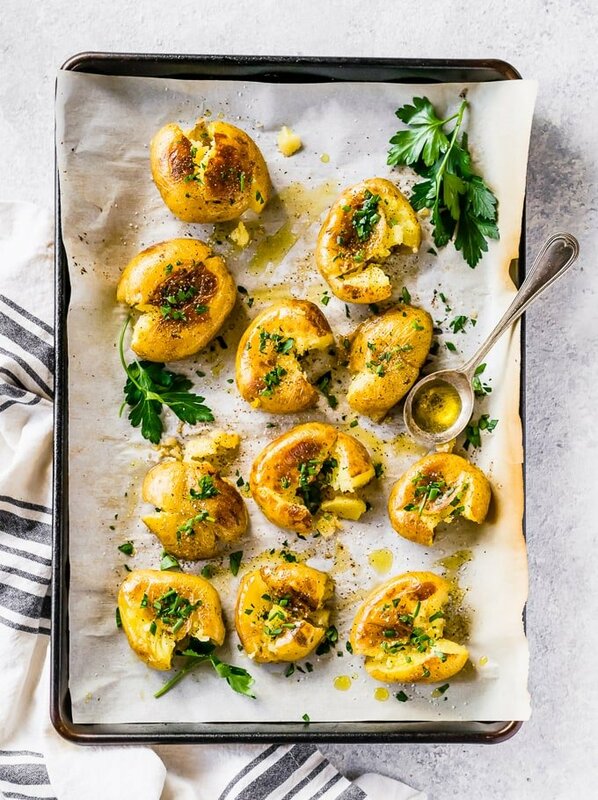 If you are in need of another spud recipe, one that is crispy on the outside, tender on the inside, one that can even be considered a finger food if no one is watching…then you are definitely going to love these smash potatoes! This Smashed Potatoes Recipe is the perfect side dish for any meal. 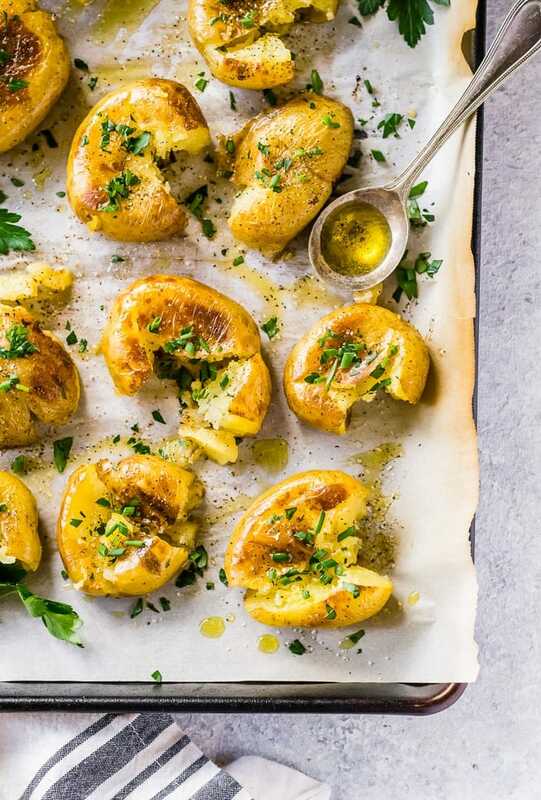 If you’re looking for something different to try, make these Smash Potatoes! You might be wondering what smash potatoes are. A lot of people might hear that term and think of mashed potatoes, but that’s now what we’re making here! It might be a little more clear if we just refer to them as Smashed Baby Potatoes…because that’s exactly what they are! While you can make smashed potatoes with any size or type of potato, I like using baby potatoes. I think they’re the perfect size! We smash them up just enough to make them flat, but not enough to make them mashed. It creates a potato dish that’s mashed on the inside, but still crispy on the outside. Everything stays intact so you could pick them up and eat them one by one like fries. But they definitely look more like smashed baked potatoes. All I know is that this smashed potatoes recipe is absolutely delicious! This Smashed Potatoes Recipe is super easy and straightforward. There aren’t many steps here, so don’t worry about things getting complicated. It’s just a simple recipe for a simple dish. 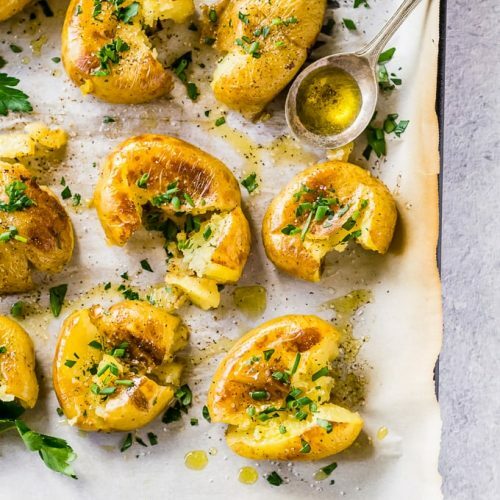 Feel free to add a bit more olive oil, or even a bit of butter, after taking them out of the oven for extra flavor. 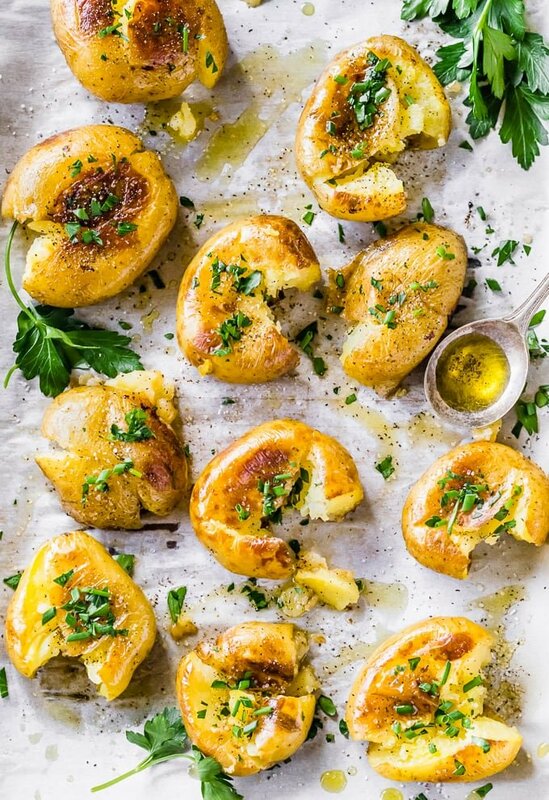 These baby smashed potatoes will get eaten up so fast! I know you’re going to love this Smashed Potatoes Recipe! 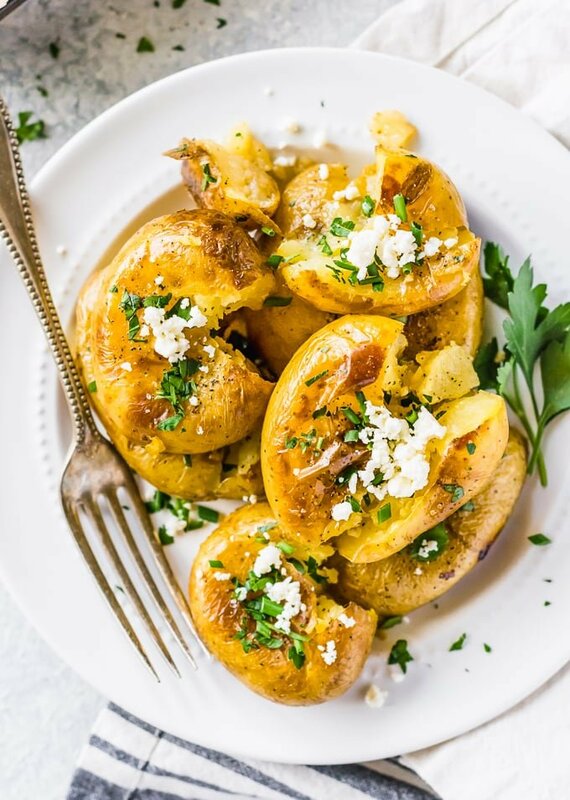 It’s always fun to try a new potato dish, and these smashed potatoes are the perfect thing to try. They’re easy to make and the flavors are simple. They make a great addition to any meal. See the recipe card below for details on how to make these Smashed Baby Potatoes. Enjoy! This Smashed Potatoes Recipe is a fun little side dish. They're nice and soft with just a little bit of crispy coating from the skin. I love using baby potatoes for these smash potatoes because they're the perfect size. Smashed Baby Potatoes are like a mix between fries and mini baked potatoes...or somewhere in between! They are just so tasty! 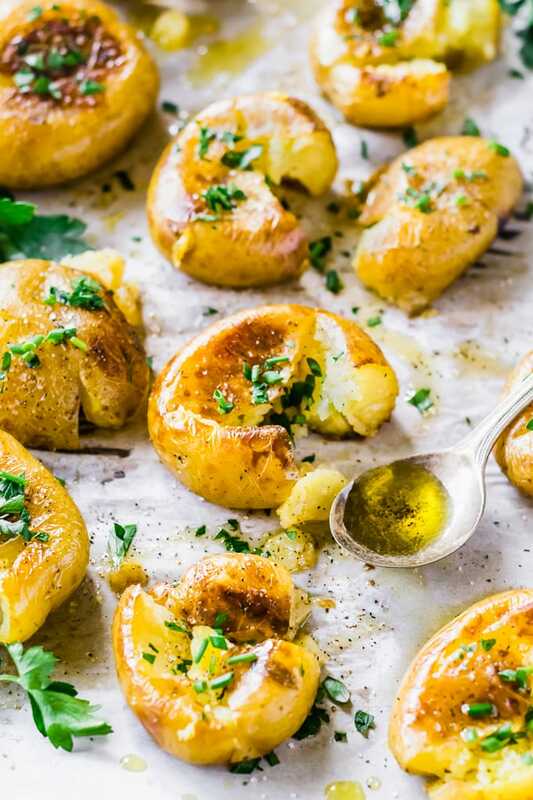 12 Baby Yukon Gold Potatoes I love the tiny potatoes for this recipe. Drizzle the sheet pan with olive oil. Place the cooked and dried potatoes on the baking sheet and leave 2 inches between potatoes. Use a potato masher and press gently but firmly on each potato until flattened. Sprinkle with favorite herbs like Thyme, Rosemary or Parisien. Bake at 450 degrees for 20-25 minutes until golden and crispy on the bottom. What a fun way to make mashed potatoes.